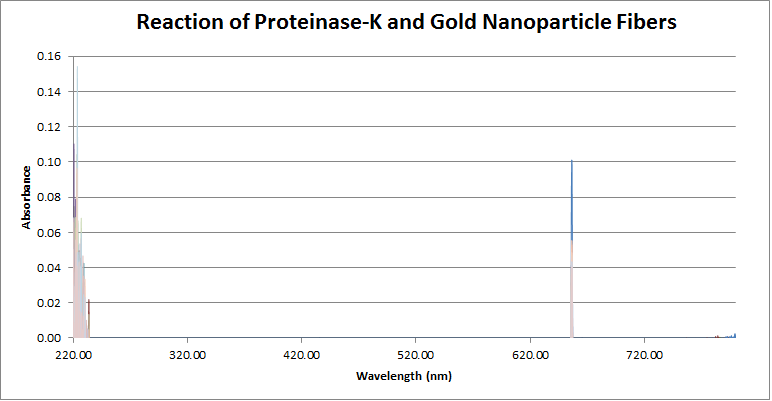 To react proteinase K with AUNP protein fibers while measuring the absorbance with the Ocean Optics spectrometer. The overall protocol for the day can be found at Dr. Harting's notebook. Inserted the cuvette into the Ocean Optics for 2.5 hours with measurements every 2 minutes (other specs found here under Description). 0.083337mL of the Proteinase K solution was added after first two measurements were made. WHAT DOES THIS GRAPH EVEN SHOW?????? Matt Hartings Can you make any observations about your ocean optics data? what happened? This page was last edited on 27 September 2017, at 01:08.